Note to readers: Bill O'Reilly says he'll be interviewing Barack Obama on the last night of the Republican convention in St. Paul. Four years ago, at the GOP summit in New York, he had another odd couple O'Reilly Factor encounter -- with Bono. Here's how that one played out, as reported in an article first published on Sept. 3, 2004. O'Reilly also opines on Ben Affleck, Michael Moore and "Stuart Smalley." NEW YORK -- Bill O'Reilly figures they'll all eventually play ball with him. His latest "Big Get" -- U2's Bono -- got the ultimate O'Reilly accolade this week. It wasn't so much for what he is, but for what he's not. "He's not a bomb-thrower," O'Reilly said after he and Bono met for the first time on Wednesday's Republican convention edition of Fox News Channel's The O'Reilly Factor. "He was certainly articulate, and he made his points. We researched him pretty heavily, and he's been pretty reasonable for the past four or five years. So it wouldn't have been fair for me to drag up old things." Bono braved The Factor's oft-ballyhooed "No Spin Zone" in support of AIDS-ravaged Africa, which desperately needs America's and Europe's financial aid, he told O'Reilly. The Irish rocker will take anyone's money on the country's behalf. 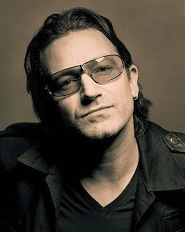 "I'm a nonpartisan guy," Bono said. "I'm rooting for people that don't have a vote and for people whose faces we don't see." Bono's onerous "handlers" were no help at all in their zeal to shield him from any and all questioners except O'Reilly. But the 44-year-old rock deity did take one query from yours truly while being whisked down the convention center's "skybox" corridor. "Oh, I think it worked well," he said, stopping briefly. "You know, I asked him (O'Reilly) to take off the gloves -- if he ever puts them on. It was really great. We don't want to soft-soap these issues. You've got to get to the nitty-gritty. That's why I'm here." O'Reilly, whose weeknightly show long has been Fox News Channel's No. 1 attraction, said his 5-year-old daughter "loves this guy. I had to get a CD signed. I think he's OK, but I'm not humming his songs all day long. I'm more of a Beach Boys guy." The host always talks with a swagger, and was entitled to on a day when Nielsen Media Research said Fox's Tuesday night convention coverage for the first time beat all competitors -- including NBC, CBS and ABC. "It sends a message that there are a lot of traditional and conservative people in this country that feel they're getting hosed by the other networks," he said. "I don't think any network is liberal or conservative. We just do news in a more interesting way. That's the key. Certainly Fox takes a more traditional approach, and voices and opinions heard here will never be heard on the Jennings, Rather or Brokaw shows. But that's not it. We're more fun to watch and our information is solid. Period." He's still goading Hillary Rodham Clinton and the Rev. Jesse Jackson to appear on The Factor, which landed actor Ben Affleck and filmmaker Michael Moore at the Democratic convention and had Sean "P. Diddy" Combs and Bill Maher on Thursday's show from the Republican gathering. "I'm making a little progress with everybody," said O'Reilly, who briefly worked at WFAA-TV (Channel 8) in the 1970s. "The show's taken on a different kind of cachet. People know if they want to get their message out to a vast audience that they need to do this." Affleck won him over by being properly "respectful." "He got a lot of currency for doing the show," O'Reilly said. "I think his picture price went up a million bucks. He held his own with me." He wasn't as charmed by Moore, a "dishonest guy" who "deserved to be scorned" by Arizona Sen. John McCain at Monday night's convention session. "But ya know, I don't dislike him like I do Stuart Smalley, who I think is evil," O'Reilly said, referring to liberal author and radio talk show host Al Franken. "I don't think Moore is evil. I just think he's irresponsible." 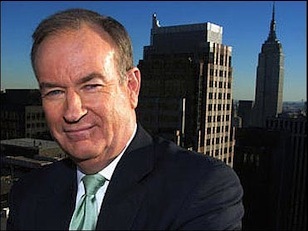 O'Reilly's provocative persona and hard-punching interviewing style is the future of TV news, in his opinion. "You have to engage people now," he said. "What they want is strong opinions about the news they already know. They don't need a feature about people making candy canes in Wisconsin. You guys are old-fashioned dinosaurs. You guys are petrified forests."